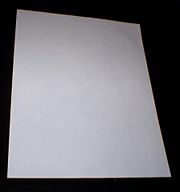 Paper is a thin, flat material produced by the compression of fibers. The fibers are usually derived from pulp made from pulpwood trees (such as spruce), but they may also be prepared from such sources as cotton, hemp, linen, and rice. As a means of communicating and storing ideas, knowledge, art, and culture, paper is one of the most important and consequential artifacts of human civilization. It has played an enormous role in the rise of literacy, the expansion of artistic expression, and the development of science and technology. It is valuable for governmental, business, and legal transactions and record-keeping. Documents printed on appropriate paper can be made to last hundreds of years. Paper is intimately connected to the fundamental human right of freedom of expression. Prior to the advent of the Internet and electronic publishing, it was not uncommon for repressive regimes to regulate the spread of information by controlling access to paper. By cutting off or tightly regulating the supply of paper for writing and printing, an authoritarian regime could control what was published and silence its dissidents. Paper is also used to make a variety of other products, such as packaging materials, cleaning supplies, wallpaper, sandpaper, filter paper, and litmus paper. As a consequence, the paper industry today is a large source of revenue and employment for many people. Many different kinds of paper are currently manufactured, catering to a wide variety of needs. People use paper to write notes, letters, memos, and diaries; to print pictures; to perform office work; and to publish newspapers, magazines, books, and journals. For these purposes, paper is available in such forms as note paper, office paper, newsprint, and photographic paper. Most magazines use coated paper, which has a smooth, shiny surface suitable for printing pictures without dispersion of the ink. Paper is used extensively in the fine arts, as the substrate for paintings and drawings and to make reproductions and prints. In addition, various crafts—such as the making of origami shapes and papier-mâché objects—involve the use of paper. A number of paper products serve a variety of cleaning needs. Examples include paper towels, paper napkins, facial tissue, and toilet tissue. Paper is also used as a packaging and carrying material, such as for envelopes, paper bags, gift wrap, cardboard boxes, and some types of food wrap. Special packaging is used to protect items such as china, clothing, and perishable foods. Some paper products, such as paper cups and plates, are used mainly because of the convenience of portability and disposal. Legal rights and responsibilities of individuals, groups, businesses, and agencies are linked to documents on paper, and people are held liable for anything they agree to by their signature on paper. For this reason, private and public contracts, titles, deeds, wills, passports, and visas are signed and stored on paper. The Fourth Amendment to the U.S. Constitution guarantees a person's rights to the security of his papers. Local, state, and national governments record and preserve their laws, bills, and statutes by printing them on paper. Court documents are similarly recorded and preserved. Paper plays an essential role in education. It is used for textbooks, notebooks, teacher's notes, student submissions, examinations, transcripts, diplomas, and so on. Libraries are stocked with material printed on paper, although archival material is also stored on microfilm and electronic media. To some extent, education is conducted orally and through the use of audiovisual and computer technologies, but paper continues to be used in large quantities. Businesses, too, utilize a great deal of paper. Besides using standard office paper, businesses use large quantities of paper for business cards, advertising media, brochures, reports, bookkeeping and other accounting tasks, packaging and shipping, displays and display mounting, and so forth. The collapse of New York City's Twin Towers on September 11, 2001, after they were hit by two hijacked airliners, has been attributed largely to heat generated by the burning of huge amounts of office paper ignited by the crashes and the fuel they spilled. Paper is important for scientific activity as well. It is used for recording, publishing, and preserving experimental data and analyses. The date or publication in a scientific journal or elsewhere—usually on paper—is generally used for establishing priority of discovery. Life's momentous events—such as births, weddings, graduations, and deaths—are recorded, commemorated, and celebrated with the use of paper. It is considered appropriate to acknowledge and mark such events by sending and receiving paper-based cards, leading to growth of the greeting card industry. A heroic deed or achievement of a major goal is often commended on a paper document. When trying to uncover and piece together past events, historians and others rely heavily on paper records and documents. Likewise, paper plays a crucial role in museums, archives, and other places that preserve historical records. Conversely, people shred or burn letters, documents, and other records when they want to preserve privacy, keep secrets, forestall spying, prevent fraud, or blot out parts of history. Paper is a medium for preserving images as well as text. Usually, photographs are printed first on photographic paper, then reproduced in magazines, newspapers, and books. The images stored on paper are frequently of equal or greater importance than words, particularly when informing future generations about past events. Examples of memorable images include the raising of the U.S. flag on Iwo Jima in World War II, and the celebrations in Paris after liberation from Nazi rule. An especially important technological development linked to the use of paper is photocopying. Before the advent of this technology, people duplicated their documents by making "carbon copies" or by a process known as mimeographing. Today, those processes are obsolete, as photocopiers can be used to generate many copies of a document quickly for use by students, businesses, government agencies, and so forth. This has resulted in a large increase in the consumption of paper. Some other important uses of paper are summarized below. Certain types of printed paper represent monetary value. Examples include paper currency, checks, vouchers, tickets, and postage stamps. Maps and routes or representations of terrain, waterways, and skyways are printed and preserved on paper. Military documents and strategies are usually presented and/or stored on paper. Architects use paper and cardboard to depict architectural drawings and construct models of proposed structures. Engineers sometimes make paper models of proposed products, such as cars or airplanes. When someone makes an audiovisual presentation, the person may also distribute paper copies of the images and text, to make a greater or longer-lasting impression on the audience. Combining decorative and protective functions, paper may be used in the form of wallpaper. Paper and cardboard are often used as building materials and in the construction of furniture. Sandpaper is used for smoothening rough surfaces or removing coatings. Blotting paper is used to absorb ink and other liquids. Litmus paper is used to test the acidity or alkalinity of a solution. In chemical and biological work, special paper is used to separate solids from liquids by the process of filtration, and to separate substances in solution by a process called paper chromatography. The history of paper begins with the ancient Egyptians and continues until today. The term "paper" comes from papyrus, the plant material used by the early Egyptians, Greeks, and Romans. In more northern regions, parchment or vellum, made of processed sheepskin or calfskin, was used instead of papyrus because the papyrus plant needs subtropical conditions for growth. In China, bamboo was used for documents, but this made them heavy and awkward to transport. Silk was also used sometimes, but it was rare and expensive. According to a Chinese court chronicle, in 105 C.E., the court official Ts'ai Lun invented a process of producing paper from rags. Somewhat later, papermakers in China developed ways to make sized, coated, and dyed paper, and paper that was resistant to insect attacks. They also used bamboo, which they heated in lye to remove its fibers . In the year 600, Chinese papermaking technology was transferred to Korea. Around 610, a Buddhist priest, Dam Jing (曇徴) from Goguryeo, brought the process to Japan, where fibers (called bast) from the mulberry tree were used. Since then, the technology spread to central Asia and India. These papermakers used hemp and linen rags as sources of fiber. The Missel of Silos (eleventh century) is the oldest known Western paper document. As the Arabs expanded eastward, they became acquainted with the technology of large-scale paper manufacture. They went on to establish paper mills in various parts of the Middle East, Morocco, Spain, and Sicily. In the absence of fresh fibers, they relied mostly on rags to produce the paper. Their defective processing equipment generated poor-quality pulp, but by coating their sheets with starch paste they managed to produce paper that was attractive to look at and good to write on. During the thirteenth century and thereafter, paper producers in the Italian towns of Amalfi and Fabriano developed new ways to improve the papermaking process, including the use of water power, a stamping mill, a wire-mesh mold, and a screw press . In subsequent years, there were continuing improvements in papermaking techniques and equipment in Europe. The Reformation of the sixteenth century, accompanied by the invention of the printing press using movable type, led to a huge rise in paper consumption and production. The subsequent shortage of raw materials, along with regulations governing the trade in rags, led to a search for substitute materials . Paper remained mostly a luxury item until the nineteenth century, when a confluence of events led to the mass production of cheap, wood-based paper. Saxon Keller invented groundwood pulp in 1843 and Mellier Watt patented chemical pulp in 1854. In addition, steam-driven papermaking machines were developed and brought into use. Together with the invention of the practical fountain pen and the mass-produced pencil of the same period, and in conjunction with the coming of the steam-driven rotary printing press, wood-based paper brought about a major transformation of nineteenth-century economy, society, and culture in industrialized countries. Before this era, illiteracy was the norm. With the gradual introduction of cheap paper, books, newspapers, and other publications became increasingly available to the general public. The art of writing letters or keeping personal diaries ceased to be reserved for a privileged few. In addition, this transformation led to the birth of the "white-collar" worker. The main developments in papermaking during the nineteenth and twentieth centuries can be summarized in terms of the following five overlapping periods. 1800 – 1860: Much of the work previously done by hand was mechanized. It included the development of machines for making, finishing, and packaging the paper product. 1840 – 1880: Groundwood pulp and chemical pulp were used as substitutes for rags, and mills were set up to process these new materials. 1860 – 1950: The papermaking apparatus was adjusted to make wider rolls of paper at higher speeds. New machines were developed to operate on electricity and produce various kinds and grades of paper. 1950 – 1980: The operational speeds of the machines and the width of the paper web were increased further, and new sheet-forming processes were introduced. New materials—including thermo-mechanical pulp and deinked, recycled paper—began to be used. Steps were taken to protect the ecology by changing the ways of handling and disposing of chemicals. Most significantly, new, automated processes were introduced. These changes led to specialization in the production of specific types and grades of paper. They also led to corporate mergers and the closing of unprofitable paper companies. 1980 onward: New chemical pulp processes and sheet-forming approaches were developed. The biggest changes in this era, however, have been related to increased demand for paper products, especially in developing countries, leading to a rise in prices of chemical pulp and problems with the location of mills. Given the need for large amounts of capital to finance these operations, big international companies have been formed, but there remain opportunities for smaller firms that meet local needs . Current papermaking processes can be divided in the following stages. The material to be used for making paper is first converted into pulp, which is a concentrated mixture of fibers suspended in liquid. The fibers are often derived from natural sources, such as softwood or hardwood trees or other plants. To manufacture high-quality sheets of paper from plant material, it is usually necessary to break down lignin, a polymeric material that gives rigidity to the plant's cell walls. The breakdown of lignin is usually a chemical process, such as the Kraft process. This step is not needed when breaking down recycled fibers, as the lignin has already been removed from the source material. If lignin is retained in the pulp, the paper will yellow when exposed to air and light. Alternatively, wood chips may be broken down mechanically, without using chemicals, to produce what is called "groundwood pulp." Because lignin is not removed from this pulp, yields are as high as 90 to 98 percent. The presence of lignin, however, causes paper to yellow, as noted above. For this reason, groundwood pulp is most often used for non-permanent goods such as newspapers. Pulp that is broken down chemically is known as "chemical pulp." The chemical pulping process breaks down the lignin and renders it soluble in a liquid (usually water), so it may be washed from the remaining fibers. Removing the lignin from wood chips also breaks them apart into the fibers that compose pulp. It is also possible to obtain the fibers from recycled material, such as old corrugated boxes, newsprint, or mixed paper. Recycled fibers do not need to be pulped in the conventional sense. As they were treated earlier, they need a more gentle process to break the fibers apart while preserving their integrity. The manufacture of paper from recycled paper products is increasing in the industrialized world today. It is now possible to buy office paper, for example, that is made from 100-percent recycled paper. Once the fibers have been extracted, they may be bleached or dyed, and special ingredients may be added to alter the appearance of the final product. For example, kaolin (a clay rich in aluminum silicate hydroxide) or calcium carbonate is added to produce the glossy papers typically used for magazines. The pulp mixture is diluted with water to produce thin slurry. The slurry is drained through a fine-mesh moving screen, leaving a fibrous web on the screen. A watermark, such as the mark used in paper currency, may be impressed into the paper at this stage. The moving web is pressed and dried into a continuous sheet of paper. In the mold process, a quantity of pulp is placed into a form, with a wire-mesh base, so that the fibers form a sheet and excess water drains away. Pressure may be applied to help remove additional water. The paper may then be removed from the mold, wet or dry, and processed further. Mass-produced paper is most often made using the continuous Fourdrinier process, to form a reel or web of fibers in a thin sheet. When dried, this continuous web may be cut into rectangular sheets by slicing the web vertically and horizontally to the desired size. Standard sheet sizes are prescribed by governing bodies such as the International Organization for Standardization (ISO). In the United States, the standard size for office paper is 8 ½ by 11 inches, and paper is usually packaged in reams (with 500 sheets per ream). After the paper web is produced, water must be removed from it to create a usable product. This is accomplished by pressing and drying, using different methods but based on the same principles. Pressing the sheet removes the water by force. Another absorbent material must be used to collect this water. On a paper machine, this is called a "felt" (not to be confused with the traditional meaning of felt). When making paper by hand, a blotter sheet is used. Drying involves using air or heat to remove water from the paper sheet. In the earliest days of papermaking, paper sheets were hung up to dry like laundry. In recent years, various forms of heated drying mechanisms are used. With paper machines, the most common drying method involves use of the steam-heated can dryer. Dryer cans heat to temperatures above 200ºF and are used in long sequences of more than 40 cans. The heat produced by this process can easily dry the paper to less than 6-percent moisture. A major issue with the use of paper is related to the need to preserve valuable documents, books, and photographs. Important documents that are regularly printed on paper include records of births, deaths, marriages, titles, deeds and real estate transactions, court proceedings, legislative actions, and actions of other governmental agencies. Most paper is processed with acid during its manufacture, and the acid content causes paper to disintegrate over time. If one examines books published 50 to 100 years ago, especially those printed during the World Wars (when inferior-quality paper was being manufactured), there is much evidence of yellowing and crumbling of the paper. In the case of newspapers, they tend to yellow and fall apart within a few years because newsprint is made with pulp that contains lignin. This problem with the deterioration of paper is a major concern for libraries and archives, both public and private. The American Library Association has attempted to forestall the deterioration of books by advocating that they be printed on acid-free paper. This effort has had considerable success, as one can frequently see notices in books, especially expensive hardbacks and other books intended to last long, saying that the book has been printed on acid-free paper that conforms to the standards of the American Library Association. One method of preserving newspaper pages and other materials is to copy them photographically on microfiche or microfilm. By these techniques, information can be preserved for as long as the processed photographic film can be made to last, which can be hundreds of years if the film is processed and stored properly. When the personal computer was first introduced and offices were converting from typewriters and older systems of document creation and storage, there were many predictions that computer technology would lead to paperless offices. Indeed, nearly all kinds of documents are increasingly being created and stored electronically as computer files, thus bypassing (at least potentially) the use of paper and the problems of paper preservation. Yet, paradoxically, offices today consume much more paper than they did in the now-forgotten age of the typewriter. Several factors have contributed to this rise in the use of paper. Given the ease of making changes to electronic files and printing out these documents, new paper copies are frequently made when files are corrected or updated. That seldom happened in the typewriter era, because creating new copies after small changes often required retyping the entire document. Moreover, the advent of the Internet has made it possible to access enormous amounts of information at a rapid pace. Consequently, people are expected to look at, process, and preserve more information. This too has led to the increased use of paper to print out more documents. Also, even with the widespread use of laptop computers, many travelers find it more convenient to print out and read documents on paper than to carry and operate a computer in a car, bus, train, or airplane. On the other hand, many communications by e-mail, instant messaging, and Internet chat boxes are not printed out. Some have complained that the art of letter writing has deteriorated because of these systems. Others have predicted that this ubiquitous use of e-mail will mean that future generations of historians and researchers will lack the documents needed to look back at our present-day age and culture, because those documents were never created or preserved on paper. In theory, records stored as electronic files should be more or less permanent. In practice, however, electronic files may become inaccessible long before the deterioration of paper documents, because computer technology is rapidly changing and newer versions of computer hardware and software often make earlier versions obsolete. Moreover, to gain access to records stored in computer files, a person must have access to the right kind of computer with the right software. Without that, it may not be possible to open the files and read them. On the other hand, documents printed on paper can be read by anyone who knows the language, without special equipment. In addition, computer files can be deleted and permanently lost almost instantaneously with a few keystrokes on a keyboard, whereas paper files and records are more difficult to destroy. This has become an issue in crime control and prosecution because businesses and other entities that have engaged in criminal activity can quickly destroy records of those acts by deleting the e-mail in which they were discussed. For that reason, deletion of e-mail and other computer files is now considered a crime, if it is done to conceal a crime. Another problem is related to the increased use of computers to keep track of voting during elections. Many people have expressed concern that unless each vote is recorded on paper as well as electronically, computer error or outright election fraud may become impossible to detect if no paper records were available. Thus there is a double edge to the issue of storing documents and information on computer versus paper. Each has its pros and cons. At least one company has recently tried to introduce cotton-based tissue paper as an alternative to wood-based paper. Cotton-based paper is far more environmentally friendly, as it is made from renewable materials—namely, cotton fibers taken from "waste" discarded by the textile industry. Cotton-based paper can be manufactured using fewer chemicals and less energy. Also, it is less abrasive and less likely to cause allergic reactions. As an alternative to expanded plastic packaging, some manufacturers have started using a paper-based material known as "paperfoam," which is somewhat more environmentally friendly. The mechanical properties of paperfoam are similar to those of expanded plastic packaging, but paperfoam is biodegradable and can be recycled with ordinary paper . In light of increasing environmental concerns about synthetic coatings (such as perfluorooctanoic acid, PFOA) and the rising prices of hydrocarbon-based petrochemicals, there is a recent focus on using zein (a corn protein) as a coating for paper in high-grease applications such as popcorn bags . This page was last modified on 12 January 2019, at 17:30.